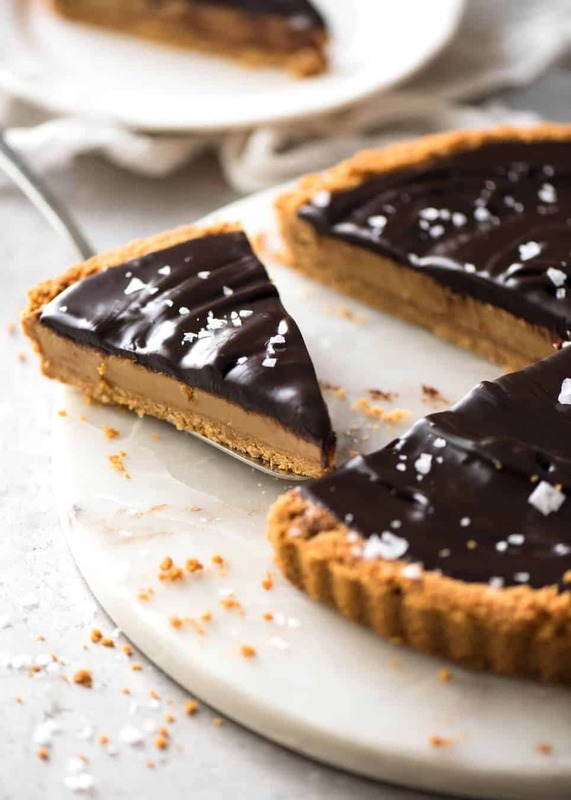 If you love salted caramel and chocolate, this Salted Caramel Tart is your dream come true! The creamy caramel filling is made with condensed milk, a secret trick for making perfect soft-set caramel without using a candy thermometer. 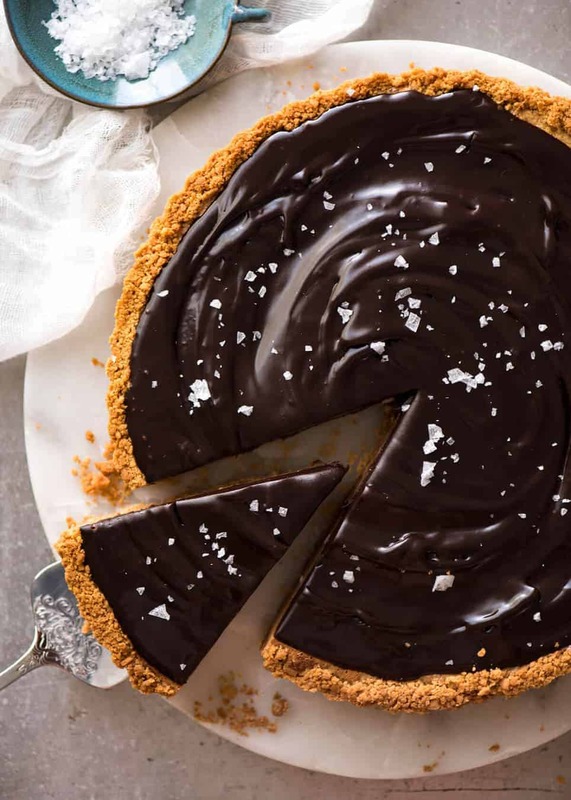 With a biscuit crust and luxurious chocolate ganache topping, it’s hard to believe you only need 6 ingredients to make this! This is probably the most indulgent dessert I know how to make. It’s sinfully decadent. 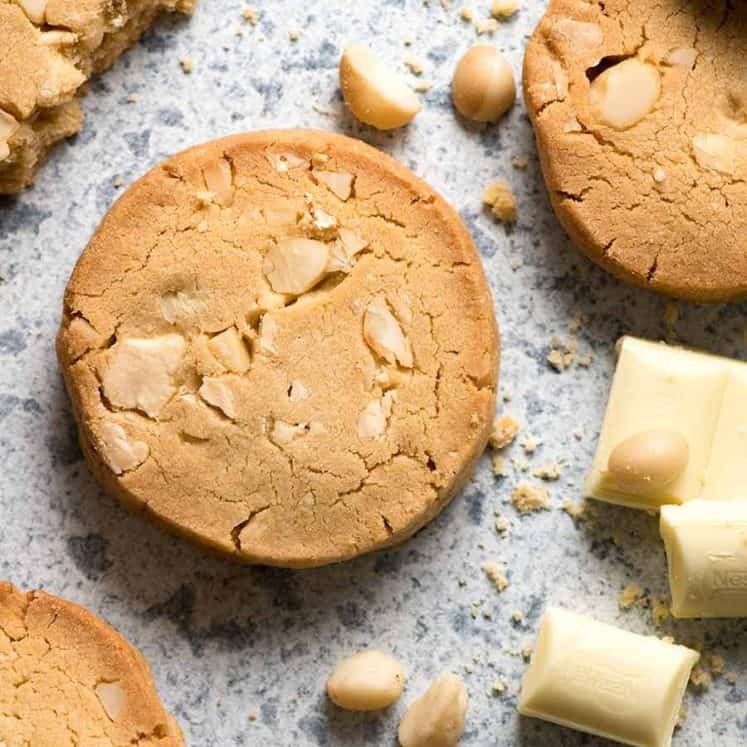 The caramel filling is truly incredible – it’s smooth, creamy, thick and so soft. It’s made using a caramel base of butter plus sugar (for the caramel flavour) which is then combined with condensed milk. Once baked, it sets, almost like a soft custard. 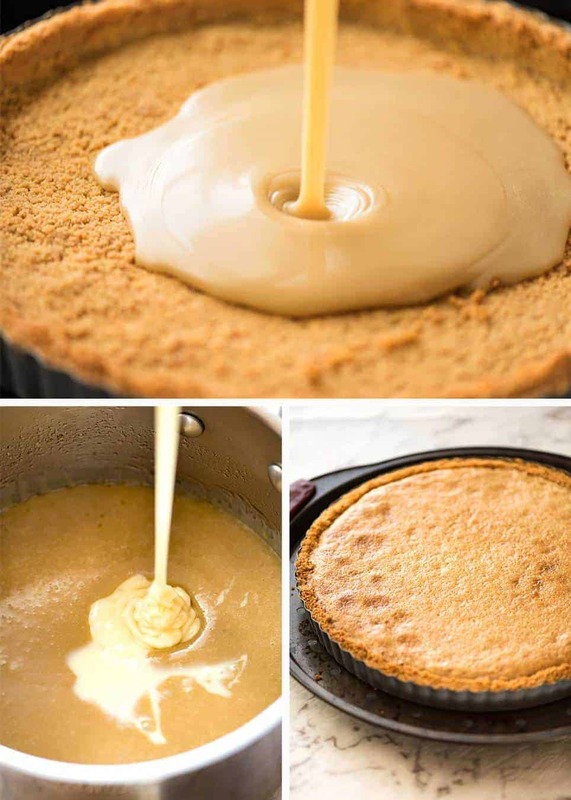 It’s different to the traditional method of making caramel fillings which require the caramel to come to a specific temperature at which point it will set to be a soft creamy caramel, rather than runny or hard. i.e. Candy thermometer required. I have it in my head that this is the Australian way of making a creamy caramel. I’d love to know if anyone knows otherwise. I feel like it’s an undiscovered secret because I never seem to see caramel tarts/pies/bars/slices etc made using condensed milk. This tart is made with a simple biscuit crust. That caramel was made for using as a glue to suction up all the loose crumbs when you inhale your slice! 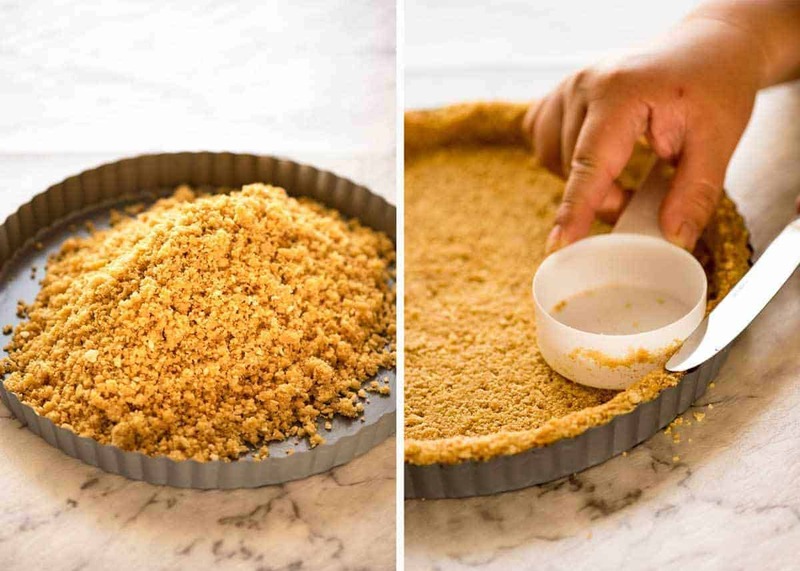 This is how I press the crumbs into the tart tin – using something flat and round with straight walls. I’m using a measuring cup here. 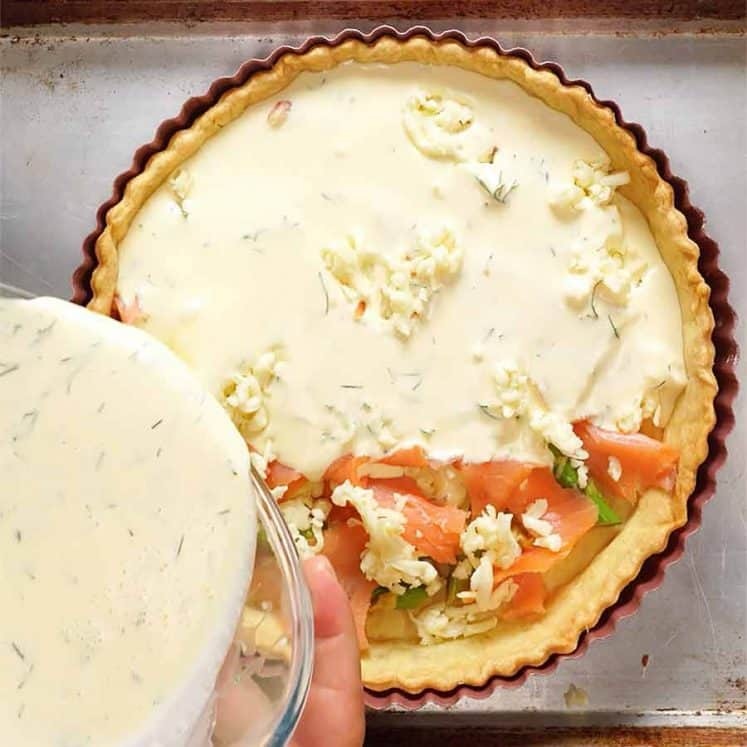 Use it to press the crumbs into the wall and a knife or your finger to level out the top of the crust, and to level out the base of the tart. As for the topping – what else could it be other than a chocolate ganache? 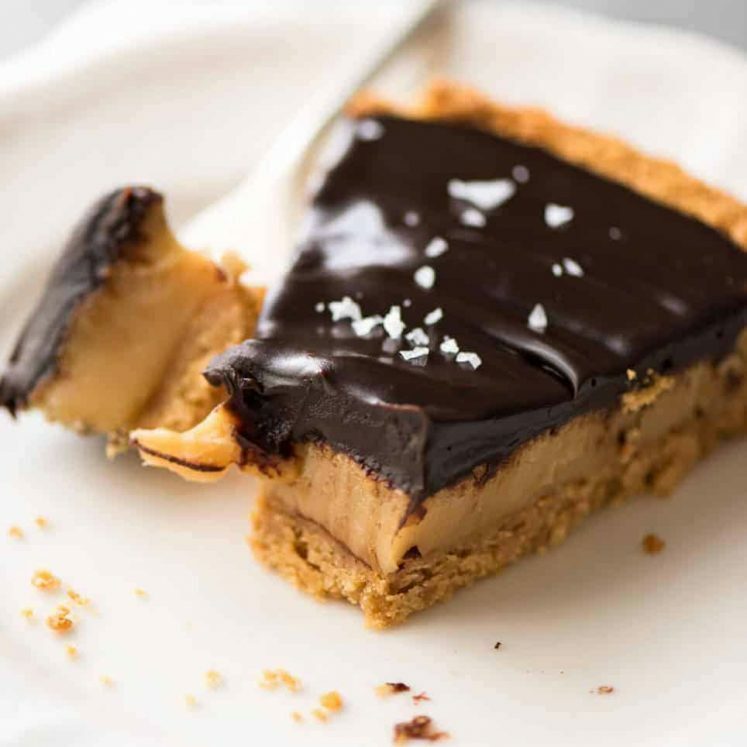 🙂 This ganache has a slightly different chocolate to cream ratio than traditional ganache recipes (which are usually 1:1) so the chocolate is soft but cuttable without smearing so you get nice neat tart slices. Many readers have jokingly noted how my very recognisable hands have been absent in videos recently. Shooting videos by yourself is seriously hard work when you have a simple home set up like I do. 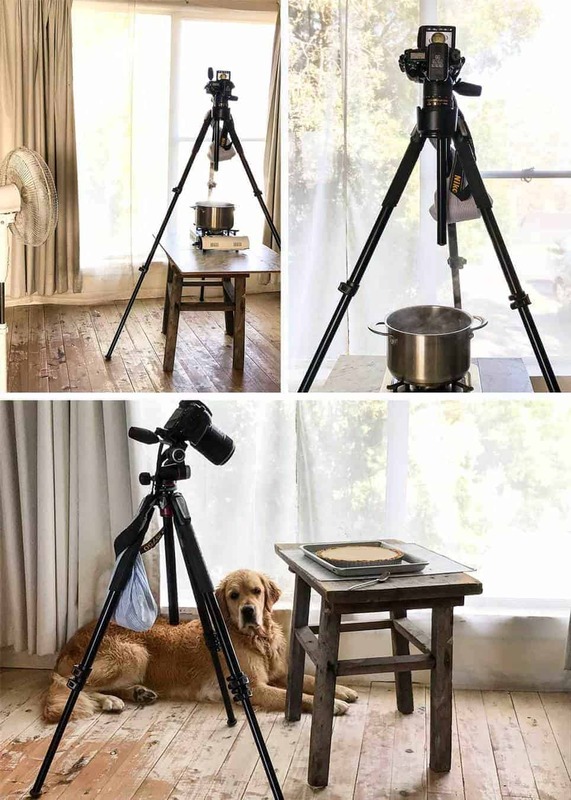 I’ve been thinking about getting a studio, setting things up “properly”. 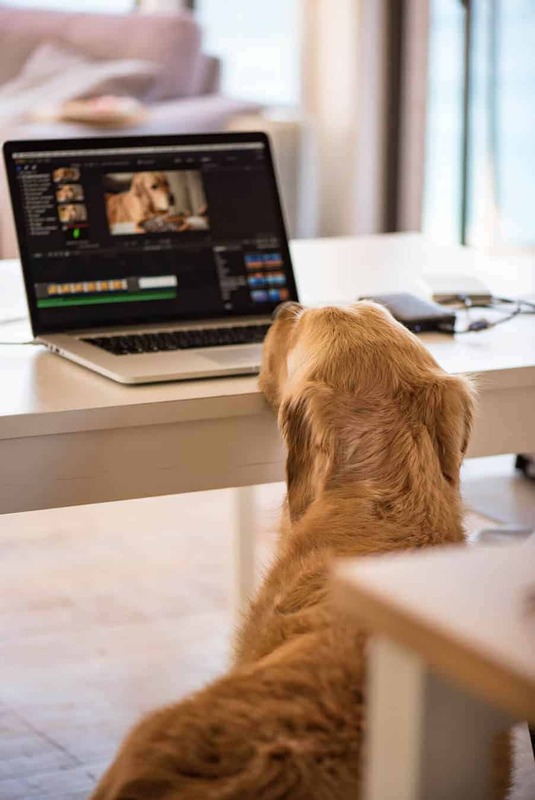 A permanent video shoot area with studio lights, a kitchen, getting a permanent support team and making my life a little – ALOT – easier. But for me, one of the things I love about my blog is how personal it is. Everything that you see is made in my pokey kitchen, the recipes are my own, created by me, tested by me, taste tested by family and friends. The larger a team gets, the less personal this website will become. Does anyone here seriously think that Martha Stewart creates every recipe that ends up on her website, her magazines, cookbooks and TV shows? I enjoy making my own videos, shooting them, editing them. In a bid to make my life slightly easier, I get my mother or a helper to come in once a week to help with food prep, double/triple/quadruple test recipes, and most importantly in my world, help with the washing up. And because everybody has nicer hands than me, I can never resist calling on my help to be my video hand model. 😂 Plus the incredible convenience of not having to wipe my hands and dash around to check the camera with every single micro step in every video! For a recipe like this, if I shot it myself, I would have to do that about 40 times – at least. I feel like this post is a little all over the place and a bit stilted. I’ll be honest. I’m a bit tarted out. I’m really trying to drum up the enthusiasm for what is possibly the most raved about dessert ever by my taste testers – and that includes the homeless man at the dog park. But I’ve made this seven times in a week and half!! Testing + a couple of video fails. As I said, I’m tarted out!! This is made using the Australian way of making creamy caramel using condensed milk. While most recipes use golden syrup to get the caramel flavour, I find it works better to use a simple caramel – better flavour and the caramel is creamier. You don’t need a candy thermometer, and the caramel sets perfectly so it is beautifully soft and doesn’t run everywhere when you cut it. 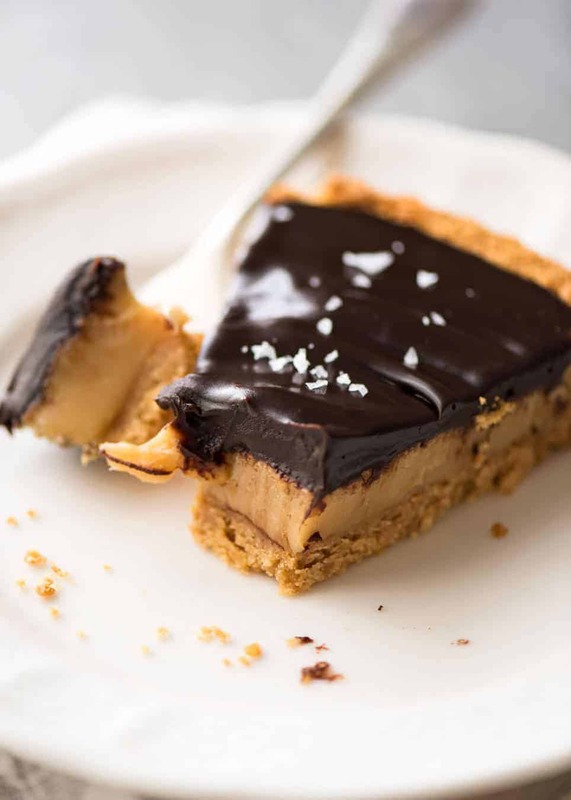 The topping is a chocolate ganache that is soft and melds into the caramel with every bite. This is decadent and luxurious, yet straight forward to make. Great show off dessert!!! Recipe VIDEO below. Refrigerate for 1 ½ hours to allow chocolate to set. Then remove and bring to room temperature before slicing to serve. Handle carefully when sliding the tart off the base - or just leave it on to be safe and just remove the sides. 1. It's best to go by weight. Using Arnott's Marie crackers and Arrowroot (popular plain sweet biscuits in Australia), it will be about 2 cups (packed). 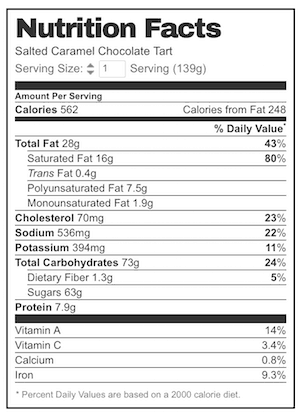 If using Graham Crackers, it will be closer to 2.5 cups. Other biscuits: Basically any plain biscuit works great like Arnott's Arrowroot works great, and even flavoured ones like Gingernut. You need about 2 cups (packed) once crushed, so if you use a different type of biscuit than those listed above, just check the quantity by measuring the crumbs in a cup measure. 2. STORAGE - This tart keeps SO WELL! It will keep in an airtight container for a week and still taste like it was made yesterday albeit the crust on the edge does soften a bit, but most people wouldn't even notice (I don't think). If it's super hot where you are i.e. the chocolate becomes melty, keep it in the fridge but always bring to room temperature before serving otherwise the caramel won't be creamy. It also freezes great - again, bring to room temp before serving. I've only frozen it for a couple of weeks but see no reason why it wouldn't keep for several months. 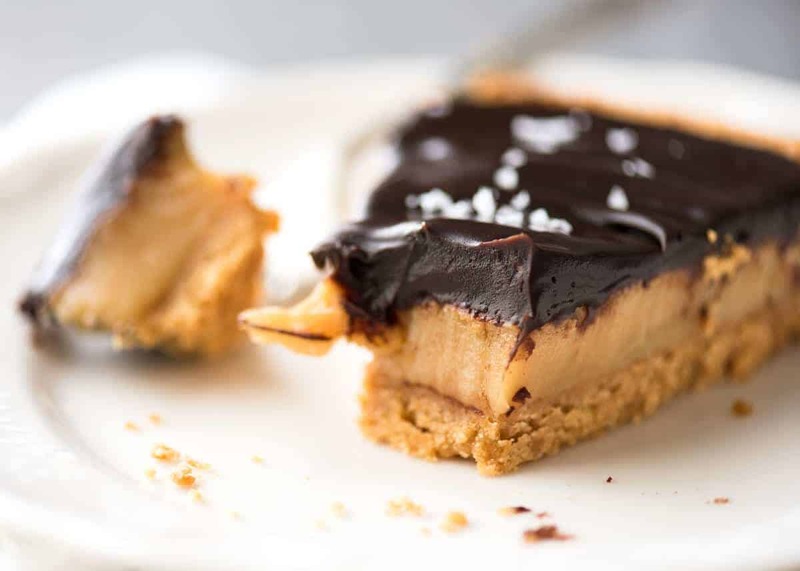 Salted Caramel Tart recipe video. So you can see how soft that caramel is and don’t miss the Dozer cameo at the end!! Helo Nagi’ i tride this cake serveral times and it is so good. Only my caremel filling stays soft. What do i wrong???? Made this recipe for my son’s 21st. I made it into small tarts with a sweet shortcrust pastry instead so easier to hold. It was an absolute hit! Epic triumph. How do you pronounce your name? Can I use a ceramic tart plate ? Hi Stef, you can but you may have difficulty cutting it and getting it out! Hi Nagi, I am very very new to this😅. May I ask if there is any difference if I use Billington’s golden caster natural unrefined cane sugar or raw sugar or demenrara instead of brown sugar? Hope to have your advice. Tks! I made this OMG salted caramel tart for Christmas eve diner… To die for! Absolutelly delicious!!!! And the step by step recipe made made an outstanding home cook (at least for one day). I feel so thankful to your devoted way of explaining every tiny aspect of the recipe, than i just can say Thank you Nagi! Just making this for the second time and it is an absolute winner!! Thank you so very much for your attention to detail in all of your recipes. One quick question though. I want to freeze this today for Christmas and I was wondering if you freeze this in the tin?? I’m nervous about wrapping it for the freezer without the ‘support’ of the tin. Thank you for all of your amazing recipes. I love salted caramel chocolate and I am so happy to find this recipe! 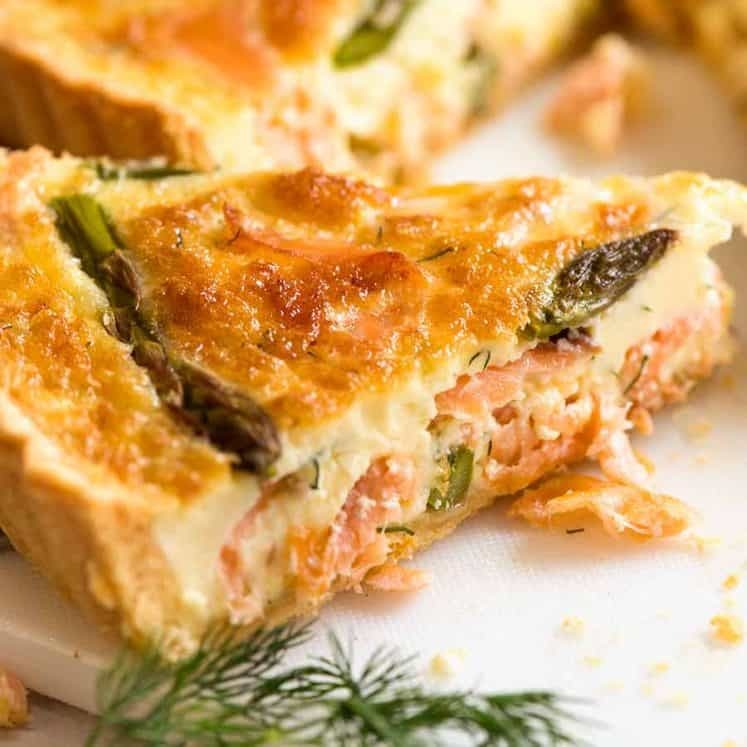 I was wondering if I can make this ahead, and let it sit in the fridge overnight, will the tart be too hard to eat it the next day? I’m gonna share this at work potluck, so I don’t know how I can reheat the entire tart before serving. Or will the tart still taste fine if I just leave it at room temperature overnight? Thanks a lot!